I much prefer to be fashionably late. 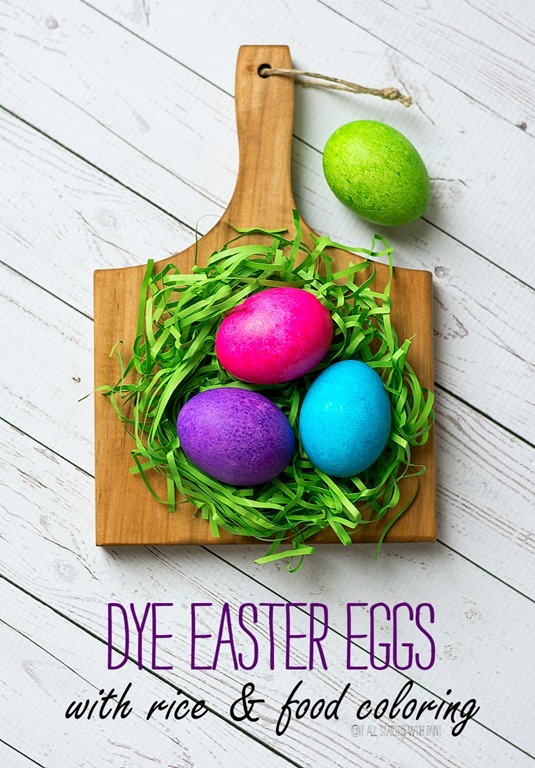 And I was going to fall back on the fashionably late idea as the reason why my how to dye Easter eggs with rice craft idea has arrived just days before Easter. 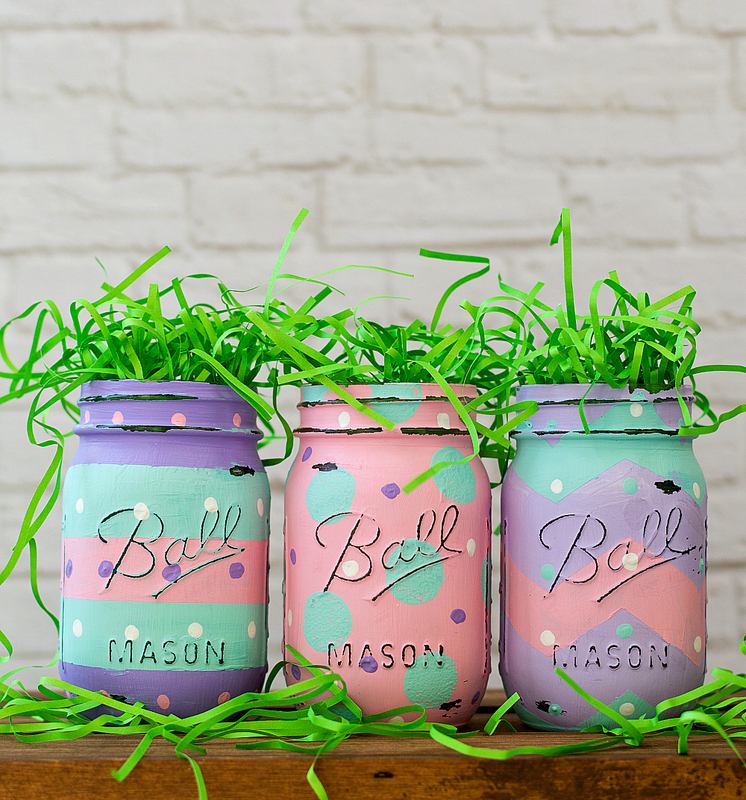 But truth be told, this Easter craft idea isn’t just fashionably late. Hey, open up! I have some freshly colored Easter eggs for you. And I made them using rice and food coloring. And I need to show you how I did it! Because when I saw this idea of dyeing eggs using rice and food coloring, I had to try it. And I was so excited about how easy it was … and how amazing they turned out … I knew I had to share it with you all. And the best part? There’s a pretty good chance you have all the “ingredients” needed in your pantry. And cupboard. 1. Measure 1/4 cup of rice and pour into Tupperware bowl. 2. Add 5-6 generous drops of food coloring to rice. 3. Put lid on and shake to mix thoroughly. 4. Add egg to bowl. 6. Remove egg and let dry. 7. Repeat with next egg. … I think I showed up with a pretty cool hostess gift! The color on these is absolutely gorgeous!! What a great idea! 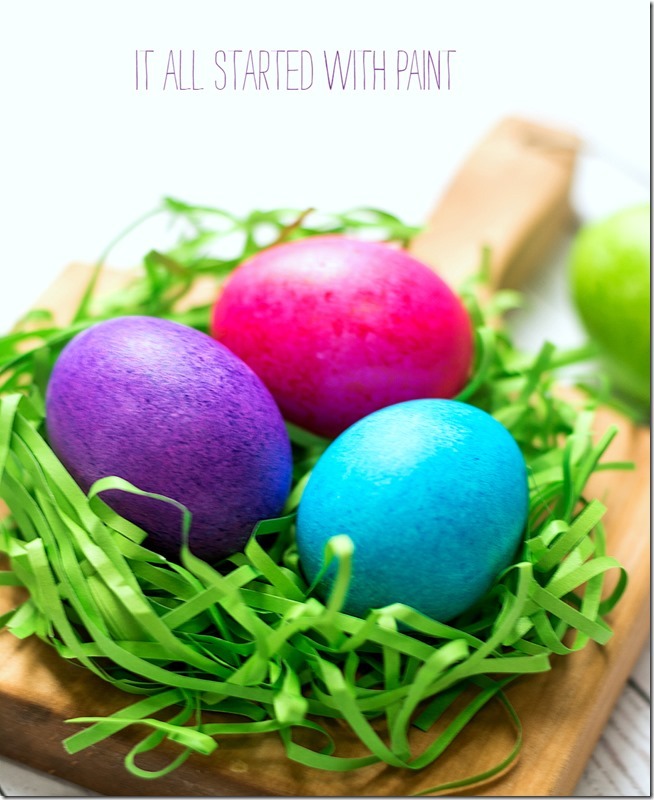 1st – in my family we never got to die eggs until Saturday night before Easter – so this is perfect timing for those sorts of families. 2nd – I would have killed for this technique when I was a kid because the colors are so lovely and bright. My mom would never let me make dark colors. 3rd – this is awesome because no vinegar smell. Wish you had been my mom. I love the perceived texture and depth of color! I wish I had known about this technique years ago. 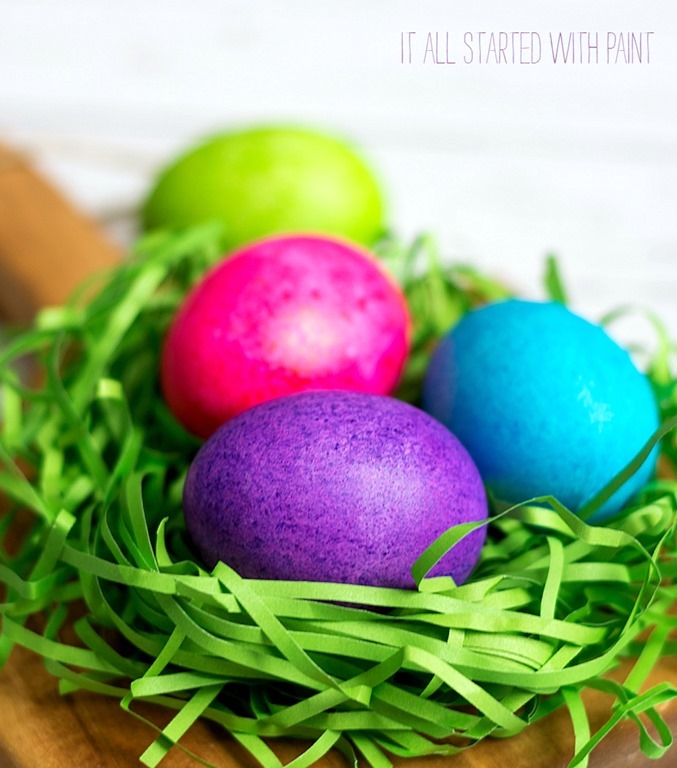 I’ve never colored eggs with my son because of the mess. This will be our first year and I am loving the simplicity! thank you for sharing it!!! Hi, doesn’t the rice get stuck to the eggs? Not too bad. And you can just brush it off before drying. Do you use cooked, or uncooked rice? Uncooked! Cooked rice would absorb the food coloring – and stick to the eggs! Great idea! About how long does it take to dry? I honestly don’t remember but it wasn’t too long. I think. If you’re concerned just make them a day before and that will give them an overnight to make sure they’re fully dry. 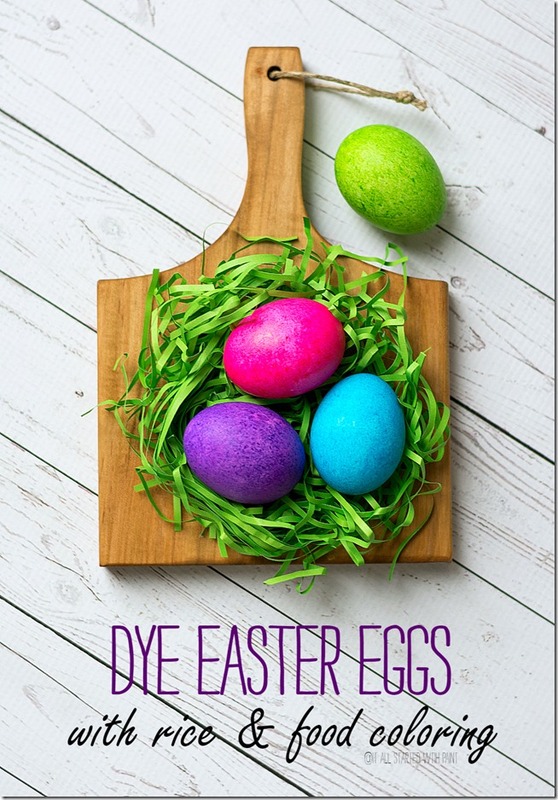 Does the dye come off on your fingers while you peel the eggs later? With the color in testy of this method, I’m thinking I may have colorful hands for days after Easter! How long does the rice/dye mixture stay wet for? 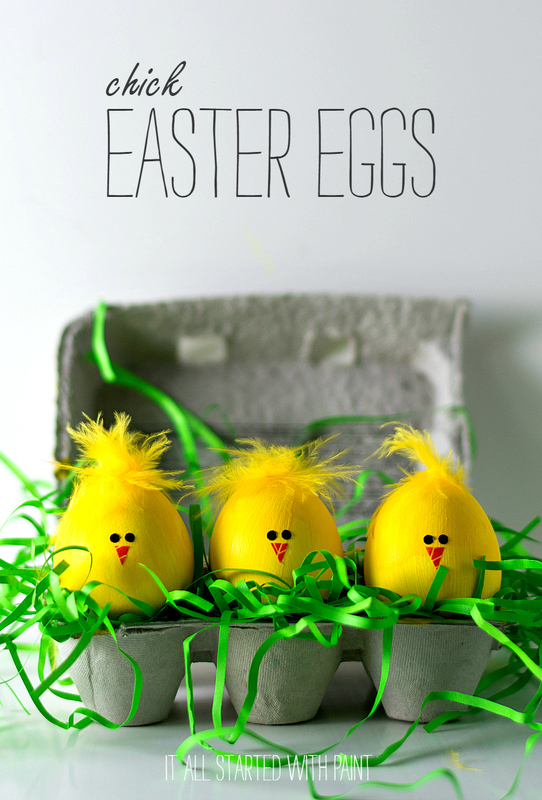 Do you need to do the eggs quickly because it dries out? Or do you need to add dye frequently to keep it moist? Hmmm … I only did a few eggs for this blog post/experiment. I’ll say that you should definitely do all the eggs at once once you start. It didn’t dry out right away but I would judge based on the color of each subsequent egg if you want to add more food dye to the mix. But it did stay wet. I am really surprised I would never have thought of dying easter eggs with rice and food coloring. I love the colors they are so bright and so easy. I would not have thought. Thank you for sharing this technique with me. Great idea! 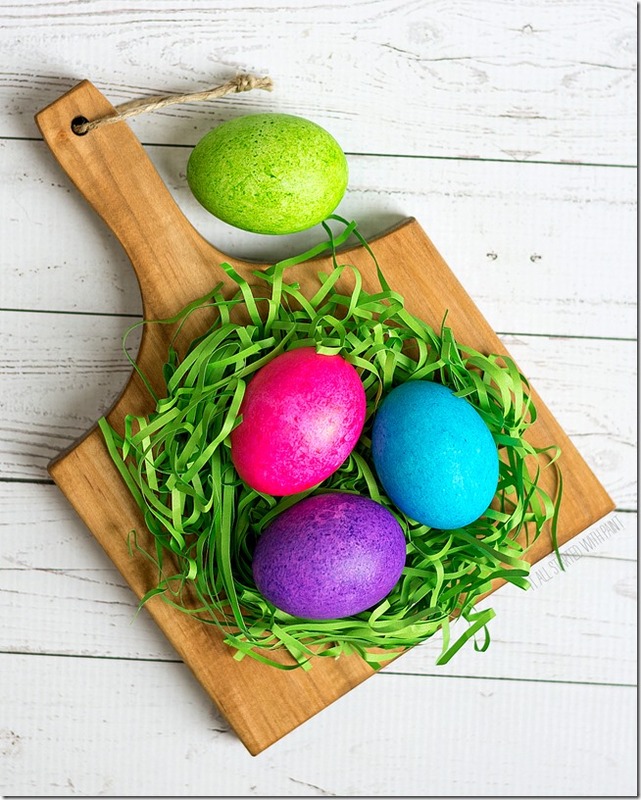 I haven’t messed dying eggs since I was born, will be 53 this Year! Going to give this technique a try. Thanks! 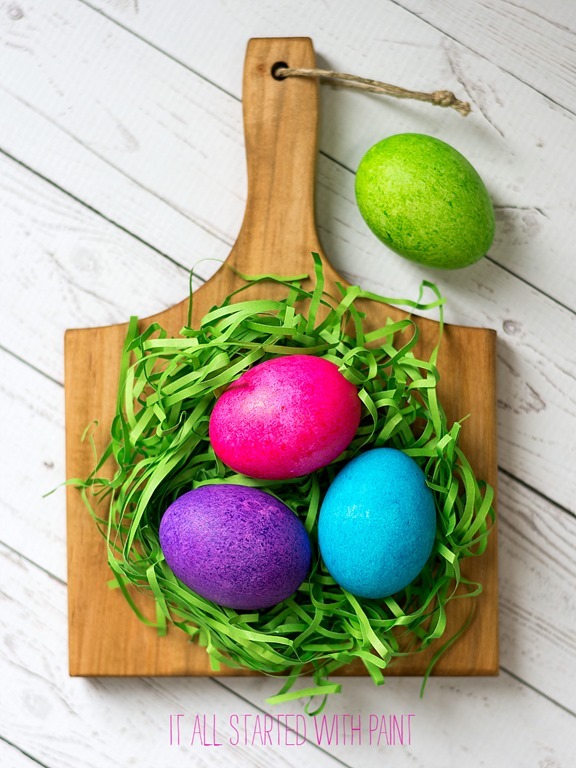 Do eggs need to be warm right after boiling or can the eggs be boiled the day before coloring? Ok, was really excited to try this. I used the McCormick neon food dye. It is not coming off on my eggs at all. Is it the rice?? Do I need to add liquid?